Doctor: It’s impossible! There’s no such thing as witches! Reverend Bell: What more evidence do you need? The Carrionite Curse is another tale that pits a classic Doctor against a monster he’ll later be much more informed about, thanks partly to what he discovered in this adventure. The Carrionites first appeared in The Shakespeare Code, a Tenth Doctor story I still need to watch, so I consulted TARDIS Wikia to see that yes, this story foreshadows that one, not by copying it, but by using certain elements in a new way. I see why that particular new Who adversary was chosen for the Sixth Doctor. He has one notable characteristic which makes him uniquely qualified to fight them. 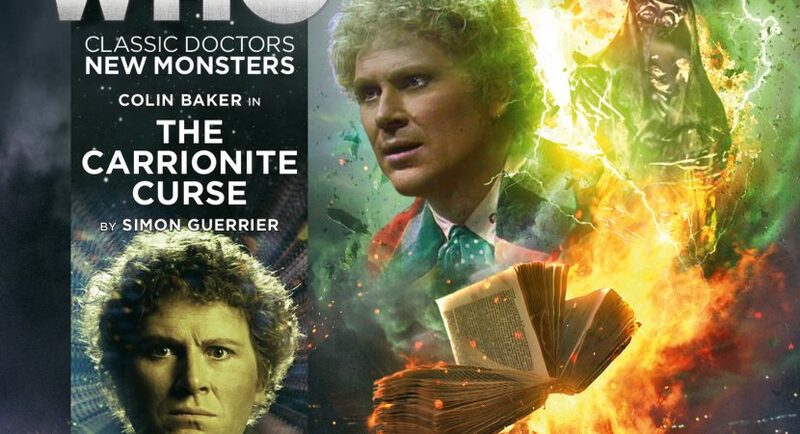 Not only is there foreshadowing to The Shakespeare Code, but also to Trial of a Timelord, adding more significance and emotional depth to this outing than a standard “defeat the monster” adventure. Also, rather poignantly in light of the actor’s recent death, there’s a few lovely callbacks to one of the Doctor’s old friends. This is an odd tale in that it seems to conclude several times, yet then it turns out there’s still more to do. In fact, I’m not entirely sure why the final resolution was the one that provided closure, when previous “false endings” did not. But despite the herky-jerky pacing, this is my favorite Classic Doctors, New Monsters story this year so far. Six’s compassion for others shines through, all the more so when he lets people down. Also, there’s one scene that lets Colin Baker cut loose in the way he does best, which had me laughing like an idiot (on an early morning walk; heavens know what passersby thought) to offset the more somber moments of the tale. Take it as read that Barnaby Edwards has cast capable guest actors again: the witches, fairly one-dimensional gloating Who monsters; Eileen Nelthorpe, a pragmatic and ruthless Councilwoman who doesn’t think much of the man in the clown suit; Goth girl Katy Bell returning from college to her sleepy village to comfort her bereaved father; and her kindhearted bookworm father, Rev. Douglas Bell. Katy is the surrogate companion for this story, a sharp-minded political science major who susses out the Doctor almost at once. He recognises that she’s a bright girl and quickly takes her under his wing. There’s quite a lot of concepts underpinning the action in this story: life and death, magic versus science, old curses and echoes from the future, different kinds of power. It’s hard to believe it’s only an hour long. Poor Doctor. I think it’s just because I’ve listened to so many so close together, but sometimes I miss TV classic Who where, up until the Fifth Doctor, it was extremely rare for him to fail. I think modern Who, including Big Finish, relies a little too often on secondary characters sacrificing themselves to strike the final blow which the Doctor can’t. It’s their choice, but I want him to be the hero, rather than the one who failed them. Katy’s death felt a little gratuitous to me, because the Doctor had already beaten the Witches several times. It reminded me of children playing the “bang, you’re dead!” “no I’m not!” game. On the other hand, I like the notion that he’s been marked with all the lives he failed to save, and that this darkness may eventually lead him to the Valeyard if he’s not careful.